Biotechnology has come to play an increasingly important role in many aspects of everyday life. Once an expensive and largely unfamiliar option, it has now become a realistic alternative to many established approaches for manufacturing, land remediation, pollution control and waste management. The application of biologically-engineered solutions to environmental problems has become far more readily acceptable in principle and biotechnology, in general, more widely understood, but there remains some uncertainty amongst practitioners regarding how and where the microscopic, functional level fits into the macroscopic, practical applications. It is precisely this gap which the book sets out to fill. Environmental Biotechnology: theory and application takes a thematic and environmentally focused approach, and breaks away from traditional rigid divisions to provide a unified exposition of the subject and an accurate reflection of environmental biotechnology in current practice. Dividing the topic into logical strands covering pollution, waste and manufacturing, the book examines the potential for biotechnological interventions and current industrial practice, with the underpinning microbial techniques and methods described, in context, against this background. 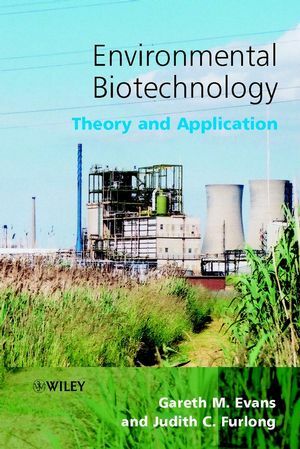 Each chapter is supported by located case studies from a range of industries and countries to provide readers with an overview of the range of applications for biotechnology. This book is essential reading material for undergraduates and Masters students taking modules in Biotechnology or Pollution Control as part of Environmental Science, Environmental Management or Environmental Biology programmes. It is also suitable for professionals involved with water, waste management and pollution control. Gareth M. Evans is the author of Environmental Biotechnology: Theory and Application, published by Wiley. Judith C. Furlong is the author of Environmental Biotechnology: Theory and Application, published by Wiley. 3. Fundamentals of Biological Intervention. 4. Pollution and Pollution Control. 5. Contaminated Land and Bioremediation. Each chapter contains boxed sections that apply specific microbiological underpinnings to environmental applications.